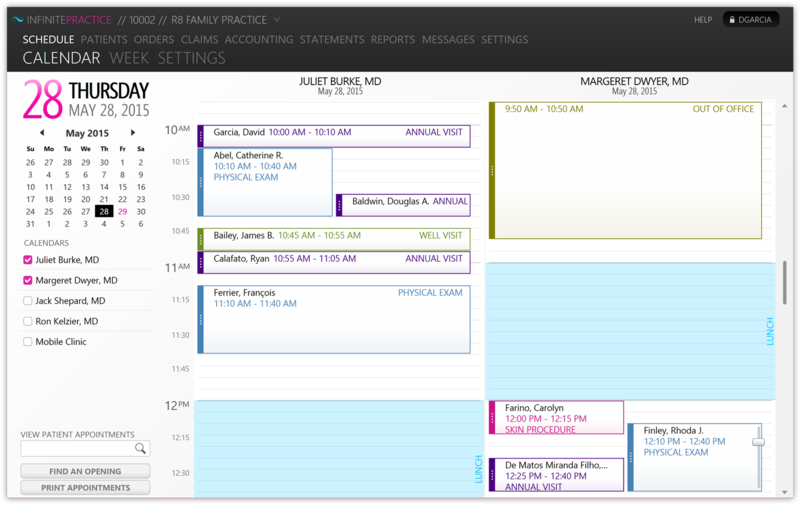 Finally, a software package that makes it easy to keep tabs on your practice. 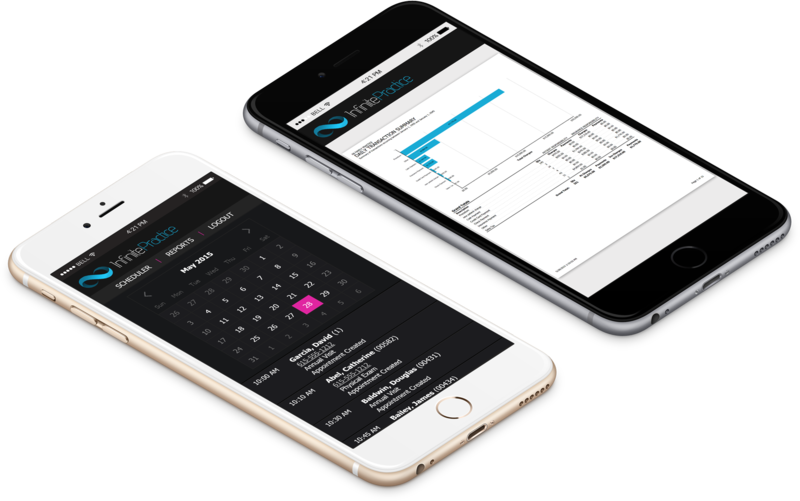 Whether it’s allowing your patients to create their own appointments online, or checking your availability right from your smart-phone, InfinitePractice provides you the tools necessary to run your practice as efficiently and effectively as possible. View multiple calendars side by side for a comprehensive view of your schedule. Color coded appointment types and blocks of time help keep your schedule organized. Double booked? No problem. InfinitePractice never tries to limit you on how you run your practice. Quickly find an opening based on criteria you specify. 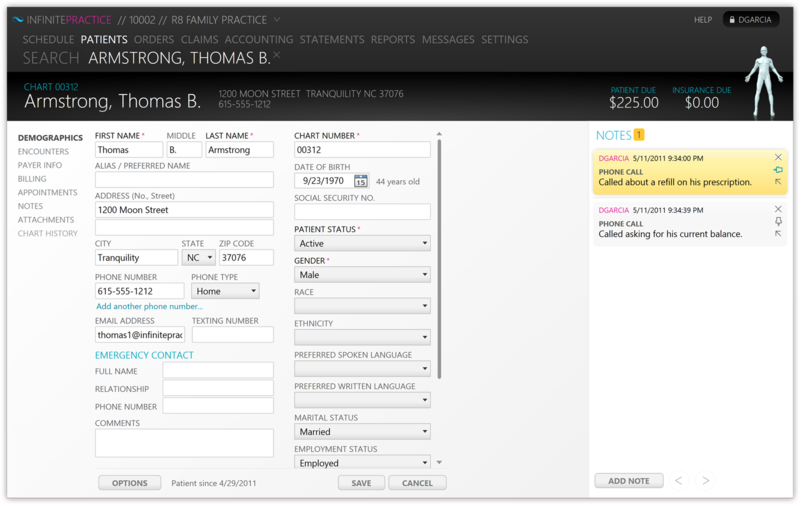 Easily add patient information, notes, claims, and even attach files, all from one place. Scan files straight into a patient’s record and skip the hassle of storing all that paper. Pin an important note to be reminded of it next time you create an appointment for this patient. Need a new note type? Adding a new one couldn’t be much easier. 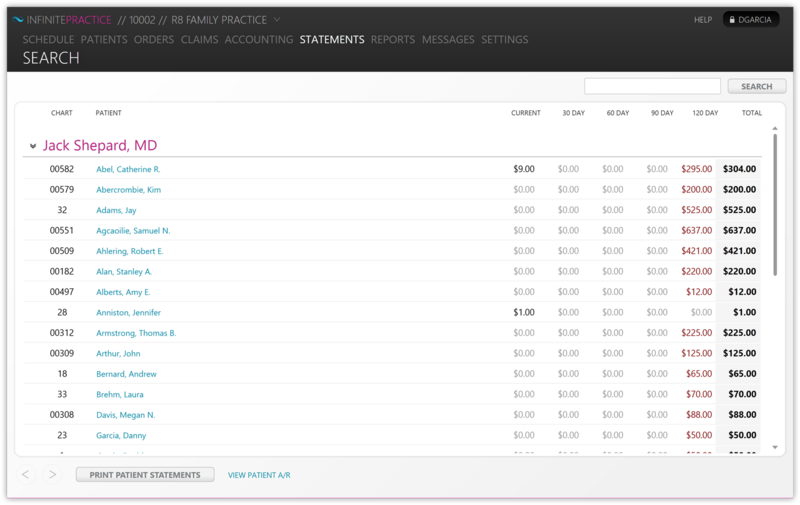 Almost all the fields in InfinitePractice are easily customizable. All communication is encrypted with banking level security, and any requests for sensitive data such as social security numbers are noted and logged. Charting your visits electronically gives you the freedom to document anytime, from anywhere, without having to pull charts and possibly misplace them. Easily review a patient’s visit history and quickly get up to speed on their progress. Access patient records simultaneously, in real time. Track visit details, worksheets, problems, procedures, order, meds, and allergies all from one place. Document new patient assessments and specific problem visits using the same layout you’re already familiar with on paper. 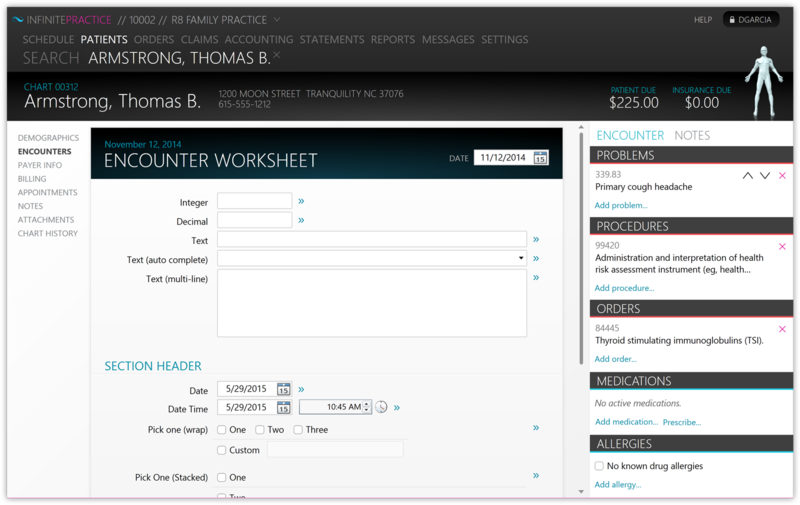 100% customizable worksheets allow you to specify field types, response options, and form layout. 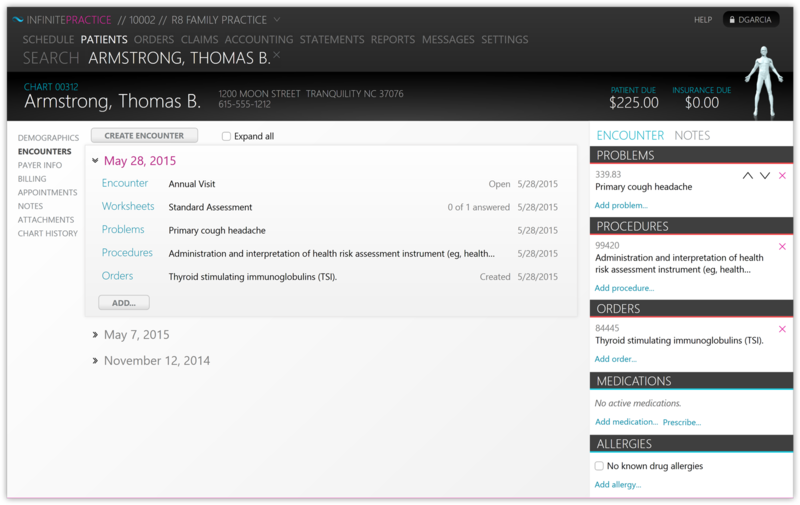 Review the response history for individual questions to track a patient’s progress over time. Review and approve assessments made by others without needing to physically pass charts around. Reports allow you to get a high level view of worksheet activity and statuses across your practice. Completely customize how you run your billing. Fee schedules can be tailored per provider. Related insurance data is automatically brought in, making entering a new insurance claim a breeze. Group multiple related procedures for quick access through a single entry. Minimize rejected claims by setting procedures to automatically check for required associated diagnosis codes. 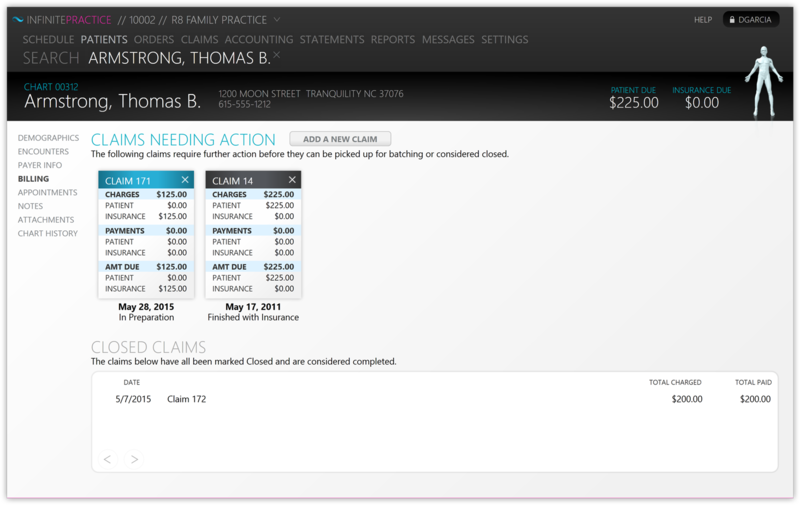 Advanced scrubbing tools make sure you have all the data you need for a smooth claims process. Keep an eye on how much a patient owes through convenient summary data shown throughout the system. 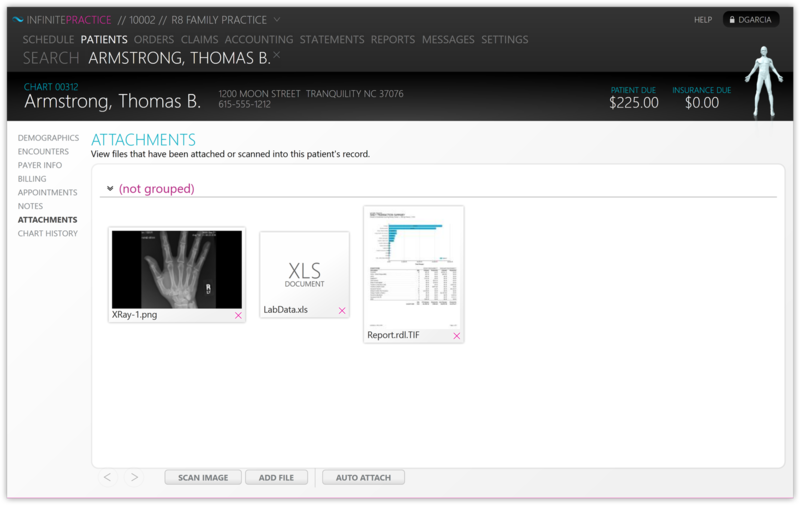 Scan documents and images directly into a patient’s record in one easy step. Easily attach any file type from any source. Quickly preview documents and access your files on the go. Save hundreds on paper storage costs by going all digital. All attachments are encrypted and stored securely in our monitored data centers. 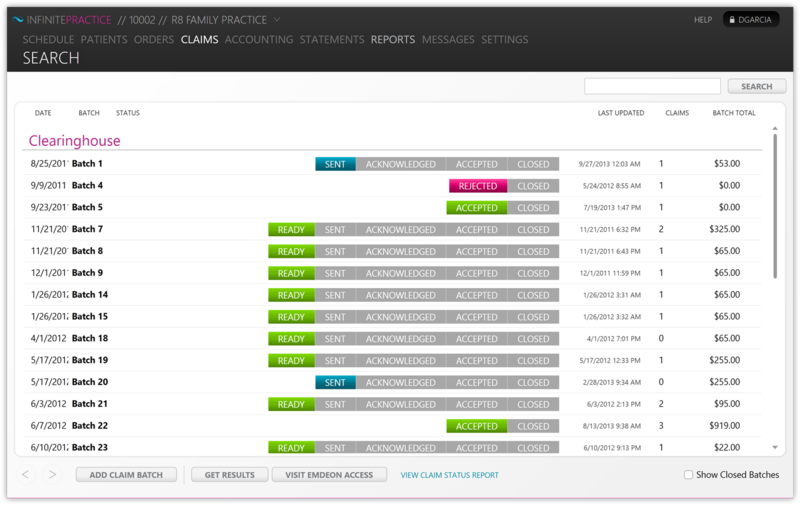 Simple batch management lets you track all of your claims at a glance. Submitting claims electronically means more accurate claims, which leads to faster reimbursements. Built in intelligence lets you know if we think a claim might be rejected, and what to do to fix it. Electronically receive updates on the status of your claims, all from one place. Rejected claims are automatically marked and highlighted, helping you decide what needs to be done. 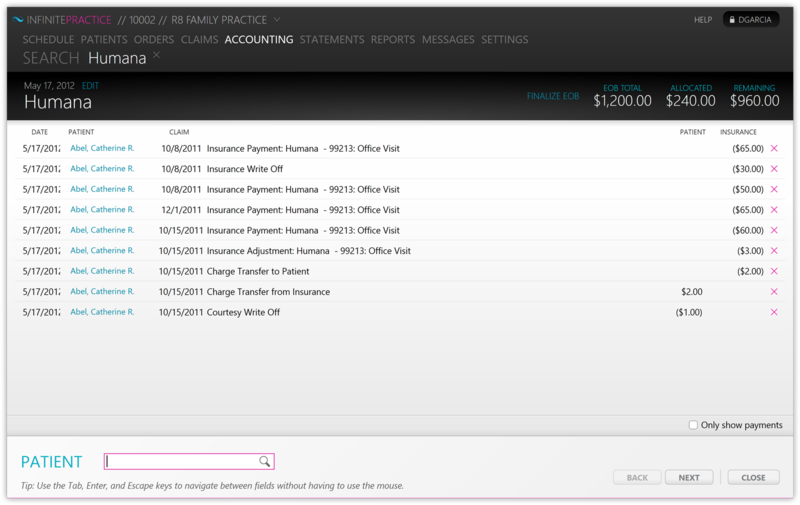 Track payments by line item to analyze reimbursement rates for individual procedures. Make payments, writeoffs, and transfer balances to patients all from one easy to use screen. Reporting tools allow you to track your money to the penny, always keeping insurance due separate from patient due. Shortcuts let you jump straight into a patient claim, minimizing the time required to find the information you need. EOB lines entered are posted directly into the appropriate claim, automatically keeping all patient balances up to date. Keep track of your patient balances all from one screen. Statements are automatically closed as they’re paid off. Clear patient statements reduce confusion and minimize unnecessary questions and phone calls. Create statements on your own schedule, whether it be daily or monthly. Print statements individually or in bulk by date. Reports give you direct insight into where your patient billing stands. A library of patient, payer, and income reports give you clear insight into the health of your practice. Powerful parameter options let you filter and format your reports to your needs. Save your reports as PDF, Excel, and Word files for maximum flexibility. Use the Patient Campaign report to create envelopes and send personalized letters to a targeted set of patients. 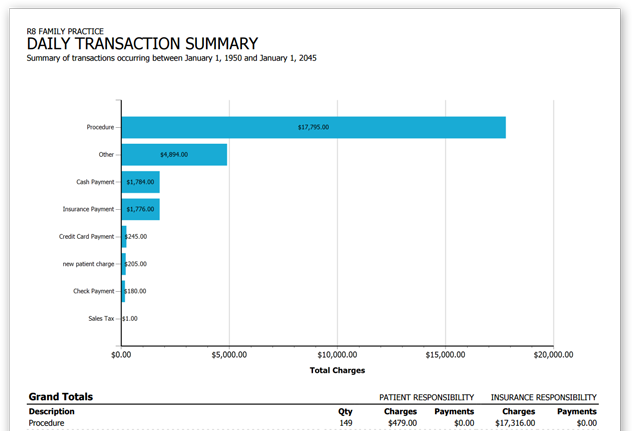 Reimbursement reports give you a quick glance at how much each procedure actually pays. 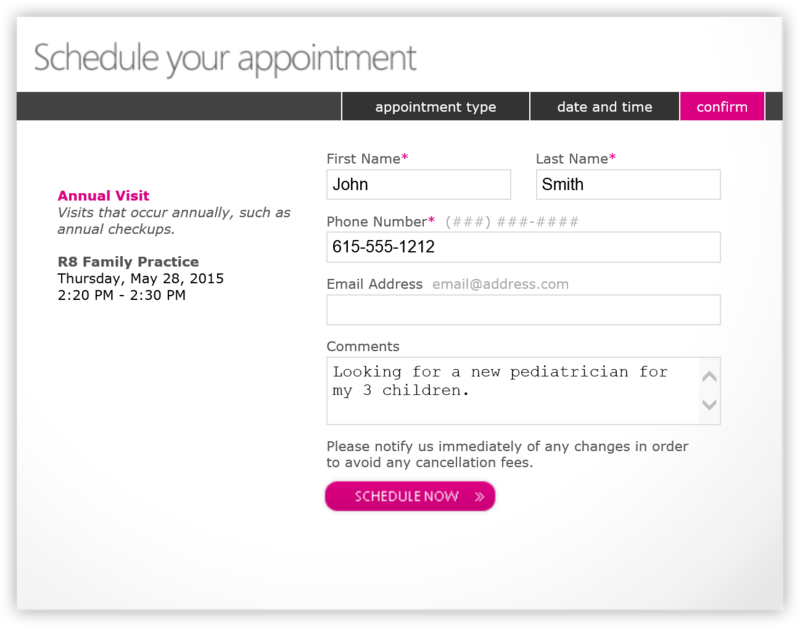 Easily enable patients to schedule their own appointments from your website. All it takes is one line of code on your site. You’re in control of which appointment types, days, and times are available online. New appointments immediately appear on your desktop and mobile calendar. No need to worry about double booking. Our online scheduler is smart enough to only show times that are available. Patients no longer need to wait for office hours to book an appointment. For some of our clients, the added visits cause the service to pay for itself! Keep your schedule full by offering times that have opened up due to rescheduling and cancellations. Outlook and Google Calendar reminders help patients remember their appointments, resulting in fewer no-shows. Easily manage appointments, view notes, call patients, and get directions to house calls. Add a new appointment in just a few taps. Any updates instantly appear on your other devices. Want to know how much was billed today? All of your reports are available from the comfort of your mobile device. 256-bit bank level SSL encryption ensures that your data is secure no matter where you access it from. Available on iPhone, iPad, Android, Windows Phone, and most other modern internet-enabled devices. Ready for more? Get started today.